I am such a huge fan of Joss Stirling. I absolutely devoured every book in the Benedict series and was always going to be really excited to read more by her. And while I wasn't initially overly enthusiastic beforehand about a contemporary series involving teenage detectives, I was definitely won over by the first book in the series, Storm and Stone (renamed Struck as an e-book). 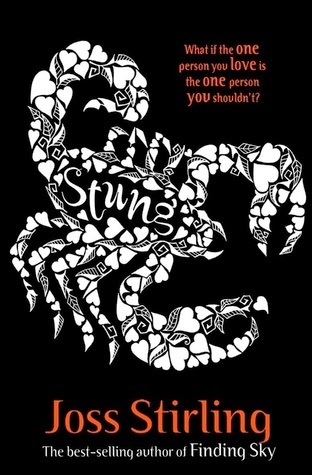 And I loved that book so much that as soon as I got a review copy of Stung I immediately dove in. Because I wanted to know more about this teenage detective agency, I wanted to meet more amazing characters and do my best to help solve whatever mystery came my way. Stung is the second book in this series and while the main focus is on two different main characters, we are able to catch many glimpses into the lives of previous main characters, Raven and Kieran and see how they are both getting on which I think can be both a good thing and a bad thing. Good because I loved them both, but bad because it highlighted the fact that I didn't feel quite the same for Kate and Nat. While I felt that Kate and Nathan were good characters in their own right, I never quite felt the connection to either of them as I did with Kieran and Raven. And while I've always loved the romantic build-up and chemistry between love interests in the past by Joss Stirling, I felt like in this book it felt a little bit rushed and I didn't quite believe in them. And yikes, this review reads like I really didn't enjoy this book, but that is not the case at all. I really did enjoy it. But mostly the thriller aspects of the book as opposed to the romantic elements. This book is about a teenage girl, Kate, who was a member of the Young Detective Agency and sent to Indonesia to help uncover a crime ring. Things went horribly wrong and Kate has been on the run for the past year, framed for murder and unable to go home or back to the YDA to explain her case. I think what I enjoyed the most about Stung is how uncertain I was about all of the characters. Kate feels like there's a leak within the YDA and she doesn't know who to trust. She suspects everyone as being a traitor but Nathan is certain that his team and others he trusts aren't at fault. I think there were some great mystery here and I kept changing my mind about who I thought the mole might be. It really left me guessing and I loved that about this book. There's also some great action scenes as Kate escapes several attempts by the YDA to bring her in for questioning. This book is filled with some really thrilling action and a great mystery to solve. While the romance didn't quite hit the spot for me personally, I'm sure Joss Stirling fans will enjoy it. I shall definitely be reading more in this series!